One time Burger Conquest special guests, Shadows Fall, were celebrating the release of their newest album “Retribution” by performing a free in-store show at Looney Tunes CDs in West Babylon, Long Island, NY. After their blazing performance, Karl, the owner of Looney Tunes suggested we get some wings and beer. 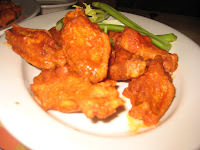 As Burger Conquest hosts the NYC Wing-Off, we have trouble saying no to good wings! 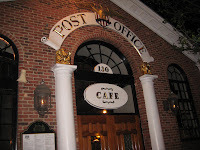 Only a short drive from the store, the Post Office Cafe is literally a converted US Post Office into a restaurant. They’ve been serving up bar foods of all types to the Babylon Village for the last 25 years. 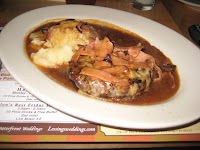 I wasn’t anticipating a Burger Conquest but when I saw the specialty burger of the day, served with grilled sliced ham, gravy and mashed potatoes, I had to run out to the car and grab my camera! After knocking back a couple dozen of the flavor-filled, hot and tangy Post Office Cafe wings, my burger arrived. My eyes opened as wide as the Grand Canyon. This was not what I was expecting. No bun, no standard toppings like lettuce, onion and the like…it was literally a burger patty, topped with melted cheese, grilled and sliced ham, gravy and served with a side of mashed potatoes. This was certainly one of the most unique burgers I have ever had. I could barely stop my hands from shaking to get my first bite. Oh my god…this thing is amazing! Whomever came up with the creation deserves some kind of ribbon, metal, trophy or handshake of thank yous and congratulations. Every day since I had it, I have considered the 1 hour and 15 minute train ride from NYC to get another. The burger was perfectly cooked and it’s juiciness combined with the hot gravy and melted cheese to create a moist, succulent and savory base to the grilled ham, which in this case is a bacon equivalent to the burger sandwich. The mashed potatoes tagged in for the standard french fries burger companion and in this case became a fantastic dip for every delicious bite. 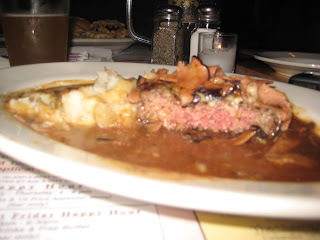 This entry was posted in Burgers, Hamburgers, Long Island, New York and tagged best burger, burger conquest, cheese, ciancio, david, french fries, gravy, hamburger, Hot Wings, long island, mashed potatoes, restaurant, rev, review, shadows fall, the post office cafe, wings. Bookmark the permalink.